The swell was hitting both the outside Western reef and the inside 2.5 peak spreading the twenty plus surfers out and allowing surfers of differing confidence levels and experience to choose their spot. The regular experienced chargers were joined by some nervous first time Dungeon riders as Kommetjie locals James Louw and Dave Richards decided to test the water and hitched a ride out to the backline in the Rebel Sessions media boat along with Durbanite Josh Redman. First timer James discovered the strength of the Dungeons when his board was ripped in two and three solid waves broke on his head before a wave runner could rescue him, while Josh added to his growing reputation as a big wave hellman when he joined “Mad” Mike Balleta on the inside west peak and snagged some bombs. “Mad” Mike simply reaffirmed his reputation by taking every wave in sight, regardless of the consequences and eventually running out of surfboards after breaking them all. 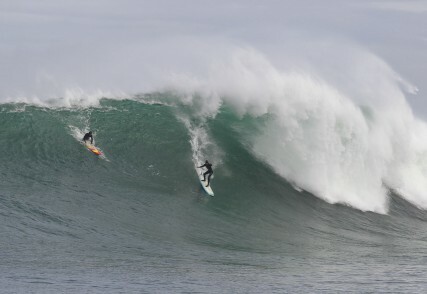 In addition to the regular locals like Mickey Duffus, Simon Louw, Andy Mar, James Taylor, Frank Solomon, Mike Schlebach and Jeremy Johnson were internationally renowned surfers Grant “Twiggy” Baker from Durban, Greg Long from California and Ian Walsh from Hawaii.